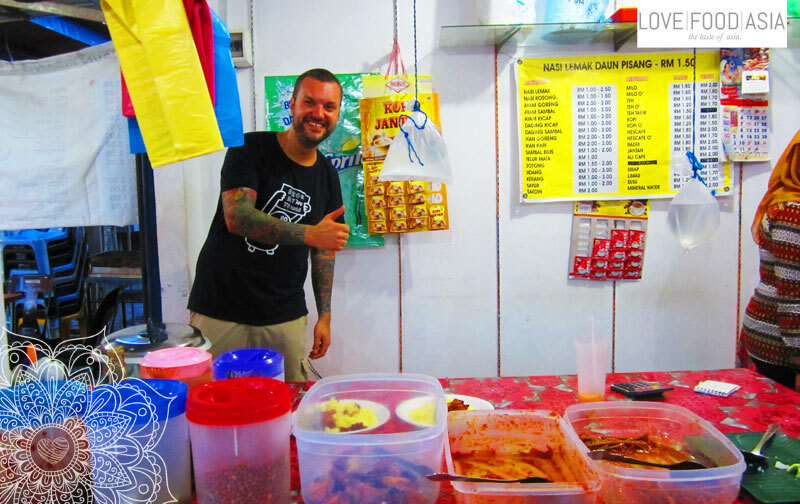 After our bad homestay experience we went out in Pentai Cenang to find some good food. But this looks like a problem on this touristy island of Langkawi. It was a hard search until we found a local place with really good food. At the dusty main street Jalan Pantai Chenang we walked like 30 minutes in one direction until we saw a little booth with some local women selling homemade food. This place has no name and all food seems to be cooked at home and then brought to this place. There are different kinds of Sambal like Ikan Bilis Sambal or Nasi Lemak served with rice, eggs and other typical side dishes. We just filled our plates ordered Teh Tarik and payed the cheap price the local women told us. Then we walked down to the beach and placed our filled stomaches on a sun lounger of one of the fancy hotels until a guy came to tell us we should leave. At night we went out to a reggae party on the beach and looked forward to leave Malaysia the next day.